I can finally devote my time to the mystery stole2. I finished the wedding stole and gave it to my sil. 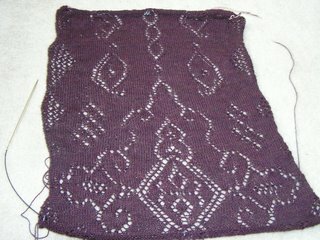 I'm seriously moving along on the mystery stole now. I've completed all of the clues given on one side and started the clues on the other side. 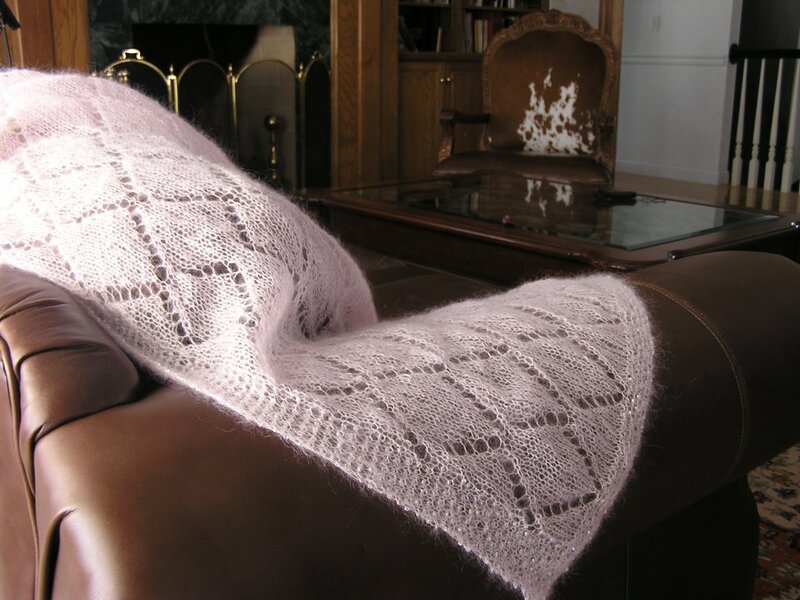 When I did the provisional cast on I forgot to purl the first row of my actual yarn and knit the set up row. Ugh! 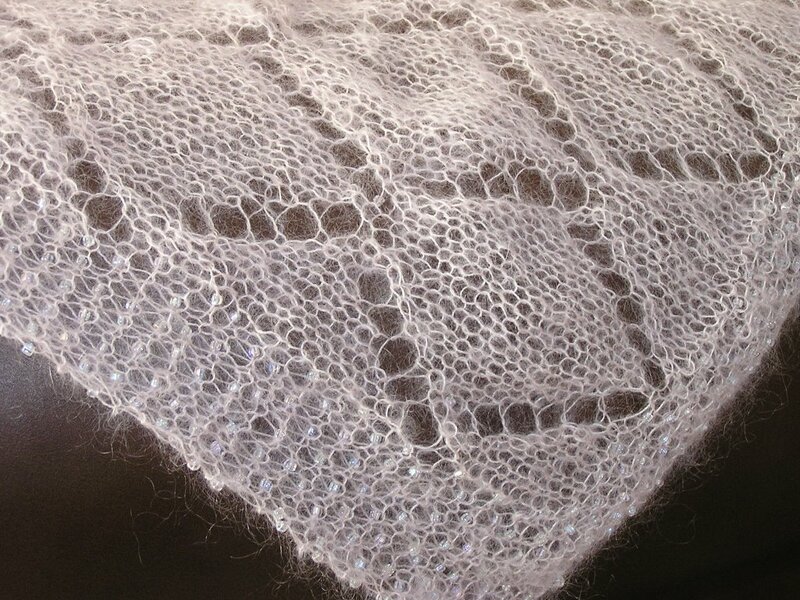 I had to pick up a pattern row then go back and do the purl row. Thankfully it worked out! Somehow it came out really funky but I looked at the stole and figured out where reverything needed to land and adjusted accordingly. 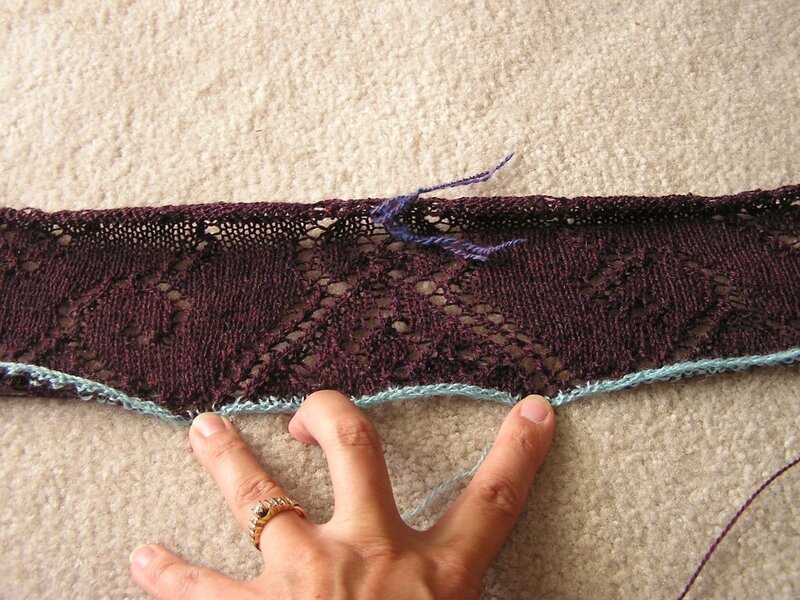 I'm doing it in Knit Picks Shadow, colorway Vineyard with some mysterious nickle needles. 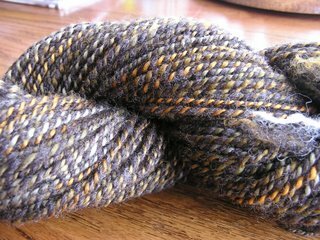 At Convergence I bought all of Lisa's Petroglyph BFL fiber but it isn't enough for a cardi which is what I thought I might like to make with it. I decided I should take this as an opportunity to expand my horizons and experiment a little. I decided I would double my yardage if I plyed it with a solid and it would make the color changes more subtle. 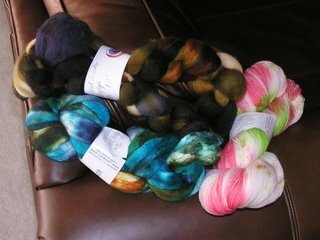 The only solids I had are carded fiber and the BFL was a combed fiber. Would the two preps work? Whenever I have a problem I pose a question to my friends at FT and I get answers! Joanne suggested I make a sample. I did I made a sample of the bfl by itself, with targhee(cream colored), and with dark shetland/icelandic. I really liked the shetland color with the petroglyph and felt that it worked fiberwise too. So I went for it. These are the results. Vicki later told me that Satakeili(sp?) from schoolhouse press is a yarn that is one ply combed fiber on carded. Cool huhn! I love it:-) Now I have to spin the rest consistently! 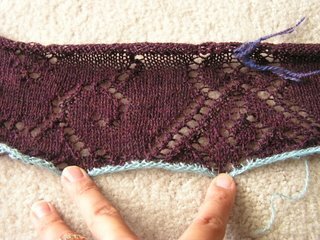 I've been dutifully trying to finish the stole for my sil's wedding. It is for her. Her colors are pinks and I thought this light pink is more interesting and wearable than white. It is my design, if you want to call it that. It is basically a trellis chart with a beaded border. I wanted to make it easy because I drag my feet on deadlines. I also think anything with ksh is very elegant and appreciated while something you might slave over will not be understood. I bought the beads from Earth Faire, I love them!!! They are triangular and catch the light so beautifully. 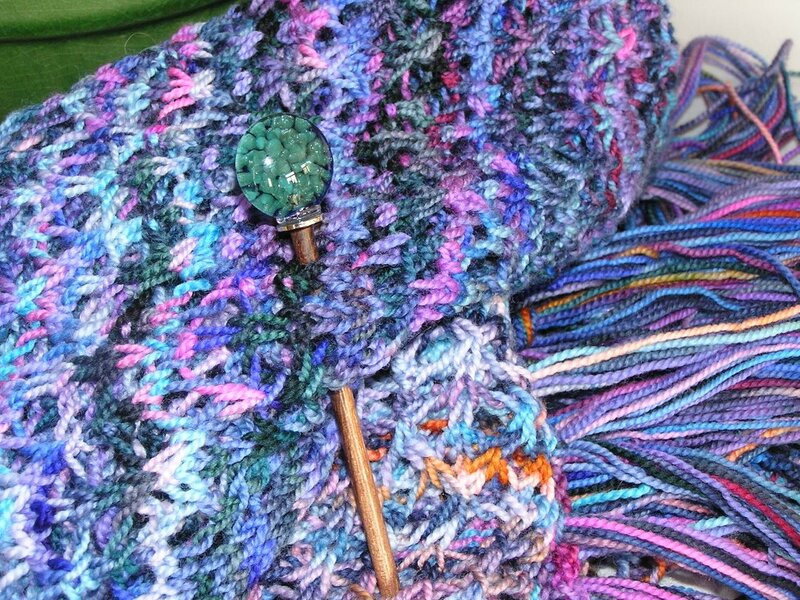 I'm also working on the mystery stole 2. It looks like it is going to be gorgeous. 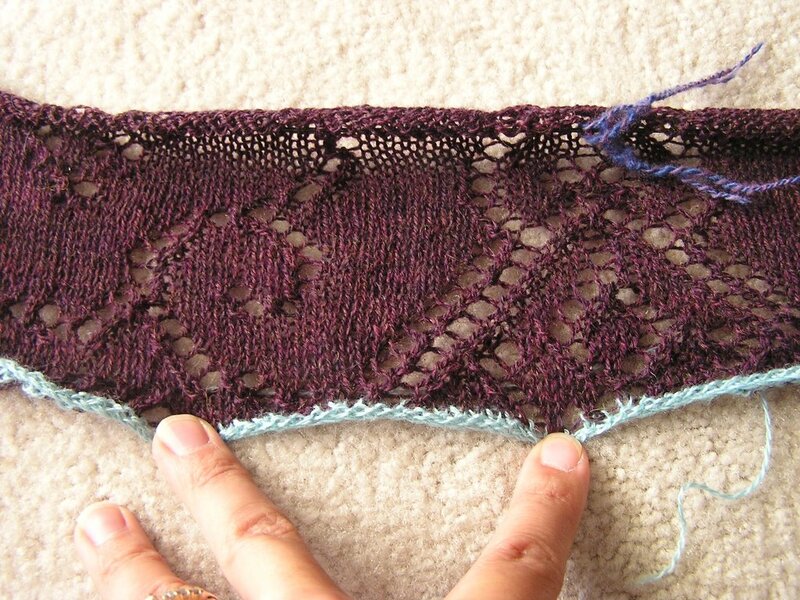 I'm using stash-knitpicks shadow in vineyard. It just looked like a perfect match to me! 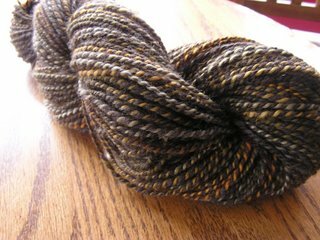 I'm also spinning some of Lisa Souza's bfl in petroglyph but am considering plying it with some thing else but haven't decided what. Akkk!! 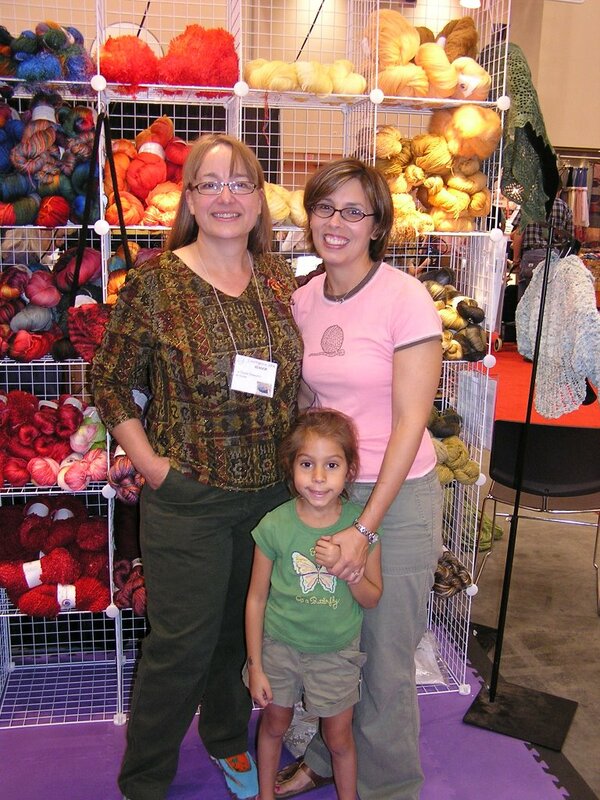 Convergence was not like other fiber things I've been to. There were lots of beads, which I didn't take pictures of but bought my share. 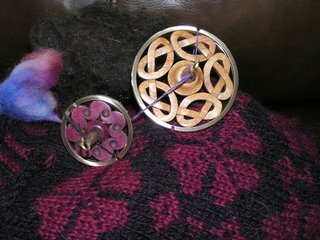 Golding- two spindles, celtic knot 1.9oz and a tsunami purple heart 0.9 oz. I am so in love with my Golding spindles. 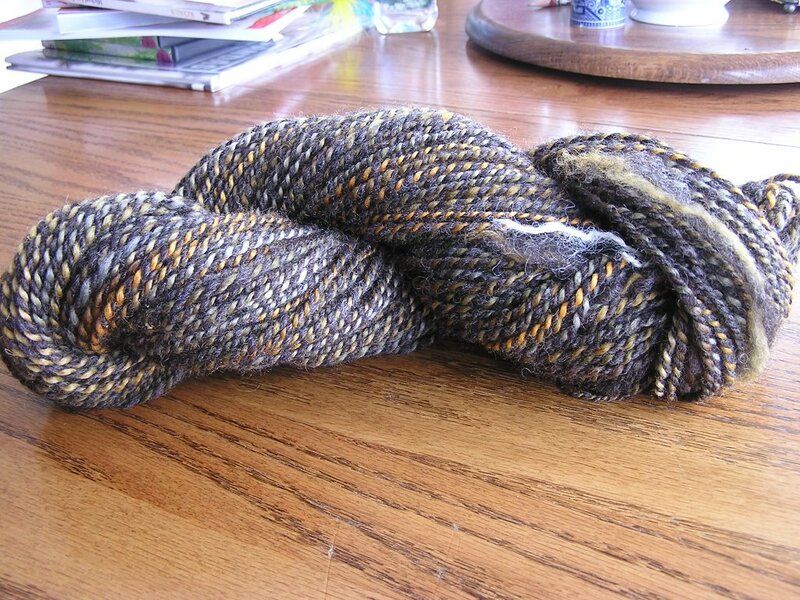 They have me spindle spinning again. 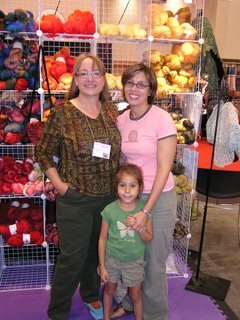 Ms Souza's booth- I got big hugs(the best part:-) and bfl in pertoglyph and merino silk in south pacific. I got a hank of sock! 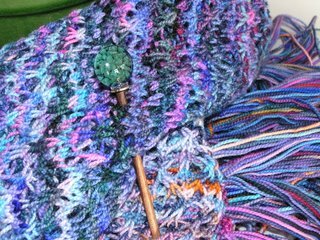 in what a melon to make small shawl for my sil's wedding but I don't think I'll malke it cause I have to finish her shawl first;-) Sheila Ernst shawl pin and great buttons which I didn't photograph bad me! This last week I spent on a retreat with my family. It was very refreshing and hard to get back to life as we know it again.